This salad reminded me of a beautiful country garden. 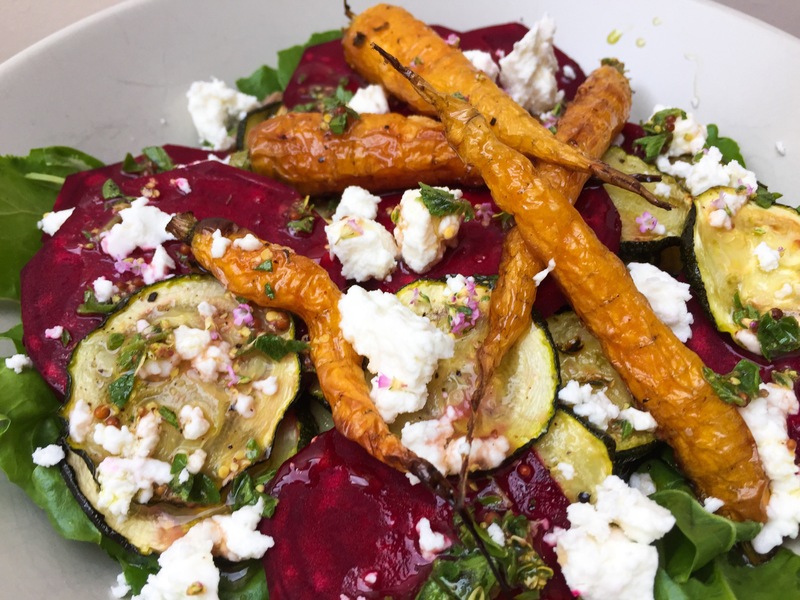 This entire dish was made with organically grown produce, the carrots, spinach, red chard and herbs are all grown in my garden and the beetroot and courgette were organically grown in the UK. The beetroot and courgette season is now underway and the baby carrots grow very quickly in all this warm weather we have been having. The weather has been amazing, apart from today! These baby carrots are incredibly sweet which is intensified when roasted. They go very well with the earthy beetroot. Root vegetables are some of my favourite, I love beetroot and carrots, I’m glad that they have come into season and will now go through to the winter. In the summer I like to have beetroot raw and in the autumn and winter I roast it. I used a lot of lemon thyme in the recipe. Lemon thyme is one of my all time favourite herbs but I haven’t used it very much recently so I am glad our plant is now ready to use. Pre-heat your oven to 180C. Slice the courgette into 3mm rounds. Place the courgette slices and baby carrots onto a baking tray and drizzle with olive oil, sprinkle with salt, pepper and fresh lemon thyme. Place in the oven and cook for 20 minutes. While the courgette and carrots are peel then thinly slice the beetroot (a mandolin would be best but a knife can work great too!). To make the vinegrette place the extra virgin olive oil, red wine vinegar, mustard, lemon thyme, oregano and salt and pepper into a cup and mix together. 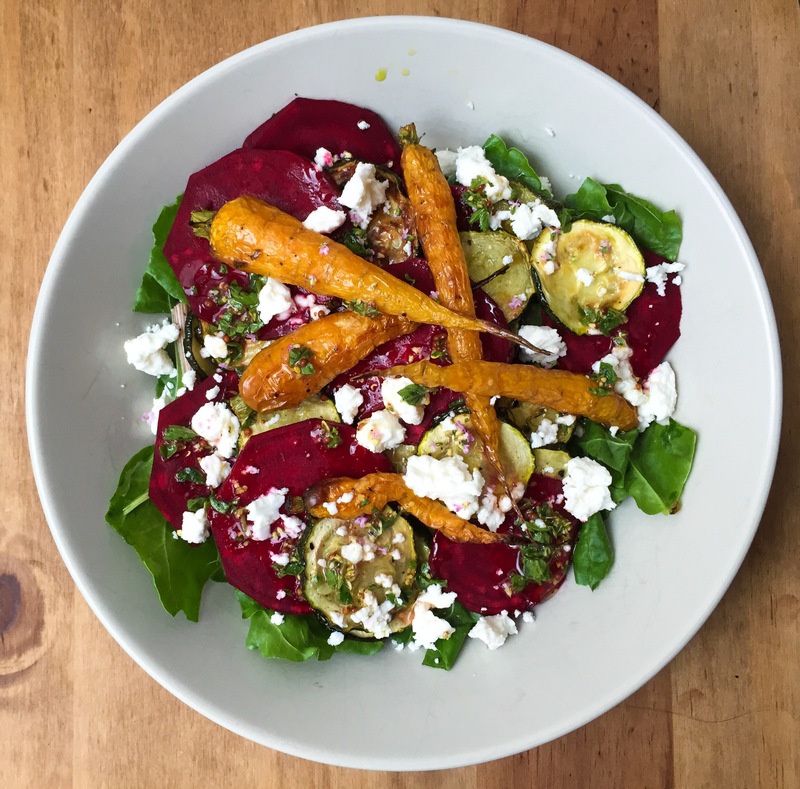 Place the red chard and salad leaves in the bottom of your bowl, spread the beetroot over the top. Once the courgette and carrots have cooked lay them on top. Break the goats cheese into pieces and scatter on top then drizzle the dressing over the salad.